When you first arrive in LA from New York City, you fall in love with the sunshine and the fact that the city blocks don’t smell like waste, human or otherwise. But as your visit goes on, you might find yourself missing some of the staples of New York City life -- pizza on every corner, the bustling energy of Manhattan, the fact that half of your day isn’t stuck in a car. Though LA will never try to be New York, the city does have a lot to offer. You just have to know where to look for the Los Angeles versions of the things you miss from home. Just be careful -- you might find yourself more in love with the Best Coast version than the original back east. Visiting LA, you’re probably worried about the food. In New York, you can get any kind of food any time you want and most of it is amazing. Here in Los Angeles you’ll find a level of quality and variety that easily rivals NYC. Plus, the veggies are fresher, since California grows an absurd amount of America’s food. So you’re eating healthier (yet tastier!) whether you like it or not. If you miss a thick New York steak and feel lost amongst the wheatgrass juiceries and seitan sandwiches of overly healthy LA, don't worry. In the South Bay, there's S + W, a place with big steaks, appetizers like PBR Hush Puppies, and a drink called "Carrie Bradshaw Died in Mexico," made with habanero-infused tequila, orange liqueur, passionfruit, and lillet rouge. 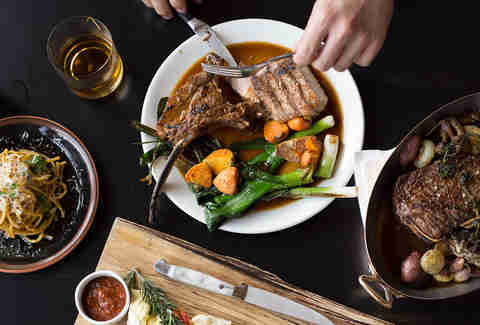 You’re not going to find anything resembling a juice cleanse here, just a wide array of red meat, grease, and whiskey -- the most important American food groups. New York’s Momofuku might be calling your name, but LA has you covered with one visit to Little Tokyo. There are a lot of ramen shops to choose from but Marugame Monzo is well worth a look. With a reasonable price, authentic quality, and no line around the block, you can satisfy your ramen needs without making a reservation a year in advance. Plus, they make the noodles fresh every day and if you get a spot at the bar, you can watch them perform their ramen magic right in front of you. Let’s say it’s dinnertime and you’re yearning for that great Mexican food New York is famous for... oh wait. New York's biggest weakness is its Mexican food. This is where LA outshines you. 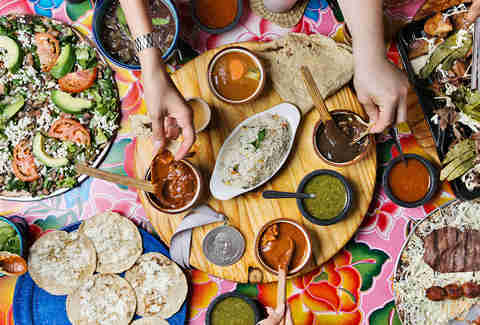 There's a million good Mexican places, but you may want to check out the Oaxacan cuisine of Guelaguetza. Nestled in Koreatown, their specialty is mole sauce but you'll also find delicious tamales, chile relleno, and everything else you could want. This nice culinary journey goes beyond tacos, which would be delicious at any truck you find on the street. But the thing you probably miss the most is pizza. New York is the pizza king and if you’re looking for an exact copy your favorite east coast slice, you’re setting yourself up for disappointment. But that doesn’t mean LA doesn’t have good options. 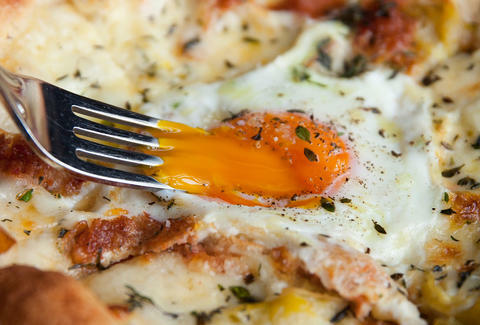 Pizzeria Mozza was created by Nancy Silverton, Mario Batali, and Joseph Bastianich to create a pizza that combines classic Italian flavors with modern California cuisine. The dough is amazing and baked in a wood-fired oven, but the toppings are more LA than old school. Squash Blossom and Burrata is a favorite, or give the white anchovy and fresno pepper chili a try. They do have a margarita pizza and some more traditional options, but it’s best to go full Angelino and try the quirky toppings. 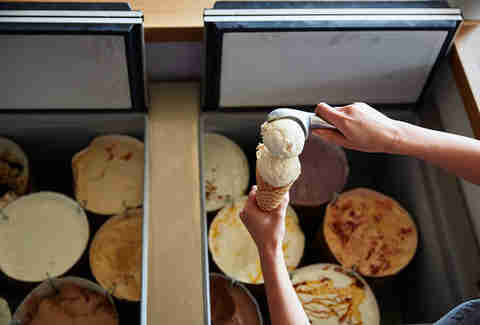 For dessert, if you were craving the bold taste of Big Gay Ice Cream Shop or Van Leeuwen's interesting artisanal scoop, head over to Larchmont and try the sometimes crazy flavors of Salt & Straw. You can get a couple traditional choices like sea salt with caramel ribbons and chocolate gooey brownie, but the real fun here is some of the wackier flavors. Try avocado and strawberry sorbet, Matcha mint chocolate ganache, and black olive brittle and goat cheese. Every flavor is shockingly good and unexpected, kind of like LA itself. New York is known worldwide for theater and you probably miss it. Honestly, there’s nothing like seeing a show on BROADWAY (please always say Broadway in your best old-timey theater voice)! For the best version in LA, check out The Geffen Playhouse and The Mark Taper Forum. Odds are good to see a film or TV star test their skills on the stage, but beyond the celebrity factor, both houses put up consistently high quality new plays and revivals of classics. You’re less likely to see musicals here, but you’ll instead witness dramas and comedies that rival anything on Broadway. Right now, you could see Alfred Molina and Jane Kaczmarek (yes the mom from Malcom in the Middle) in Long Day’s Journey Into Night or the quintessential show about Chicano life in LA, Zoot Suit. Or, enjoy the medium that LA made famous: movies. We’re not talking about hitting up an AMC where half the crowd is texting the whole time. No, in LA you can enjoy a film with a bit of the old time flair that brings back the golden age of cinema. Bonus: you’ll never have to go up three escalators to get to your screen. For a fun LA movie going experience, try the New Beverly. Owned by Quentin Tarantino, this legendary venue shows double features of mostly forgotten classic films that don’t snoot genre stuff like B-movies, Westerns, exploitation films, and old comedies you’ve never heard of. Occasionally, a Tarantino film will pop up, but it’s primarily the best way to expose yourself to the nooks and crannies of movie history. Plus, it’s $8 to see two films. You can’t see half a movie in New York for that price. When you first visit, LA hardly seems like a city. It’s true that the “I can walk everywhere” life is pretty hard to come by, but there are pockets of Los Angeles that give you a real urban feel. If you miss the old school downtown punk rock and art scene of New York, LA has one weird spot that will take you back to the strangest days of ‘80s Times Square. The California Institute of Abnormalarts is not an institute and some people would say it does not feature art. This club in North Hollywood is mostly a collection of bizarro wonders: circus acts, B movies, strange art, and freak shows, the only guarantee is that you will have a one-of-a-kind night when you visit. If that’s still a little too normal for you, there’s a courtyard display of lovely items such as a picture of a dead clown and a two-headed baby in a jar. Just try to find a two-headed baby in jar in New York nowadays. Damn you, Guiliani! For art with fewer human remains, check out Soap Plant in Los Feliz. 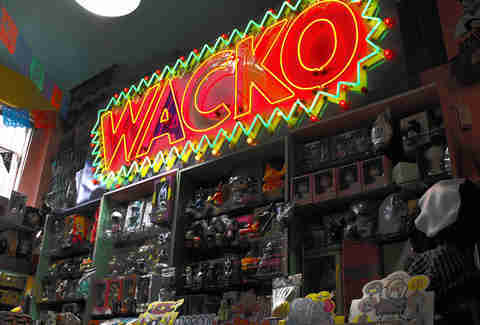 It’s not a soap factory, but a collection of pop culture weird stuff and knick knacks from across the decades. The store describes itself as a “pop culture toy shop with punk rock attitude.” You’re bound to find an odd little piece that makes a way better souvenir than a T-shirt with the Hollywood sign on it. Let’s say you’re not in the mood for the fringes of city life, but looking for a neighborhood that has skyscrapers, hustle, and streets where people actually walk. Then take a trip to Downtown LA. It’s a recent development that Downtown is even worth visiting since it fell into near ruin in the ‘80s. But with a renewed effort from the city, downtown is going strong again. Plus, it feels like a real city, not the usual sprawl that haunts the rest of LA. The great part is that there are people around, but every sidewalk isn’t packed with idiots who don’t how to walk. It’s less like Times Square, and more like Union Square... but divested of 80,000 people. So enjoy strolling down the street in peace. Visit the Downtown Arts District that’s fully walkable and full of shops, restaurants, and bars to enjoy. You’ll find art galleries, restaurants/yoga studios and even an indoor shooting range. It’s a microcosm of the whole huge city in one small space. If you find yourself missing the hipster charm of Williamsburg, don’t worry, because LA has artisanal mustache wax to spare. Echo Park and Silverlake are the new neighborhoods of quirky gentrification. The Time Travel Store is a real brick and mortar shop that sells things exclusively for time travelers. You can get a conquistador helmet and a dinosaur egg all in one place! That’ll definitely beat out your Williamsburg “thrift” stores that sell garbage denim jackets for $150. Nothing can beat the intricate design and appeal of Central Park. With its summer concerts and seemingly endless acres, there was always something new and wonderful to find there. Well, similar to Central Park, Griffith Park is a huge swatch of land in the middle of the city. Unlike in New York, you can climb miles of vertical trails and experience lovely views of the city. Hiking is so common in LA, you’re ostracized from society if you haven’t posted enough Instagram pics of yourself smiling from the apex of your climb. Griffith Park also has a carousel, an observatory, a little train, and the Hollywood sign. Though the hike to the Hollywood sign is a touch overrated, it’s one of those touristy things in LA that you kind of have to do. Like, did you really want to walk the Brooklyn Bridge? But you did it, right? That’s the Hollywood sign. Walking around New York, there’s an endless supply of beautiful architecture and feats of building. In LA, you might see large stretches of highway and boxy homes and offices, but there are lovely examples of architecture here, too. New York’s highlights are art deco, gothic revival, and a few modernist buildings. And while you won’t be surprised to learn LA is rich with art deco and modernism -- check out The Broad Museum for a splendid example of the latter and an art tour -- you might be surprised to learn it has more than a few gothic structures. And no, they’re not all churches. Stop by The Regent Theatre on South Main St for the architecture, but stay for its TS Eliot-approved Prufrock Pizza (and adjacent Lovesong Bar) until it’s time for a movie, play, or concert. It’s like the entire NYC to LA comparison in one building. Want to expand? One style that’s very rare to find in the East is mid-century modern and LA has that in spades. In almost every neighborhood, you’ll find kitschy signs that are remnants from the ‘50s and ‘60s and the squared off, harsh lined homes that would fit in perfectly into an episode of The Brady Bunch. 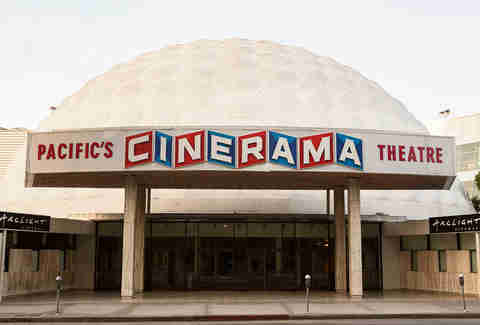 Check out the Cinerama Dome, a huge movie theater sitting under a half golf ball like dome. For an early example, visit the Eames House, one of the most famous mid-century modern buildings in LA. Built in 1949, it was incredibly ahead of its time and has a unique California feel. Nightlife in LA feels really weird at first when you get here. You have to think about parking, designated drivers, and that perfect moment between Uber surges. In New York, you take a train or hail a cab and drink to your hearts delight. But once you figure out the best way to hitch a ride, there’s a huge variety of bars to keep you happy all night long. If you miss the fine cocktail culture of New York, you might want to try No Vacancy. A Hollywood speakeasy within an old Victorian home, you’ll get delicious drinks and something you’d never find in a cool New York bar... space. Yes, this speakeasy isn’t a walled up basement with a few leather chairs strewn around, this bar is in a roomy house with a full beautiful courtyard. The cocktails are delicious with a little more of an old Hollywood vibe than the Prohibition nature of NY speakeasies. Maybe you’re more of a dive connoisseur. Well, LA might have the advantage on New York in this category. It’s hard to keep dives alive in NYC when nearly every building is being sold and turned into a luxury condo tower or a Chase bank. LA has the benefit of ample square footage, so you can find a decent dive in any neighborhood. For an old school, no frills, dark (literally “Am I talking to a person or a coat rack?” dark) head to Los Feliz’s Ye Rustic Inn. It’s been open since 1971 and once inside, you’d think it was still 1971 except for the employees’ lack of bell bottoms. You can get beers and wings and they open at 9am on the weekends, in case you wanted to get an early start. If you’re in the Valley, try Chimney Sweep in Sherman Oaks. Inside a strip mall, the bar has more of a "old aunt’s basement" feel rather than a dirty, dingy dive. With a fireplace and a simple bar menu, you'll enjoy the extra space LA's dives have to offer. Los Angeles will never be New York and that’s what makes the city great. It’s a city at a different pace with way more space, but still has the little gems that make city visits exciting. So, find what you love from New York while embracing LA’s quirky charms. It should be easy with the constant sunshine.